Job Opportunity And Free Resume Bank - Free Job Listing, Free Resume Database. Post Job Opportunity Free. Post Resumes Free. Connect With Employers. Find A Job. This is the premium Job Opportunity Bank . . . the world's premium job bank with lucrative jobs from all around the world. The purpose of this site is to help you find your dream job in your dream organization no matter where you live in the world. Consequently, job opportunities are listed . . .
You find the job of your choice faster. However, this web site does more than just list jobs. It is also the world's premium Free Resume bank. It's pretty simple . . . we provide a sophisticated platform for you to connect with employers of your choice through your resume. Our servers host your resume, your personal information bank, free. Unlike most job sites, we offer you an opportunity to promote yourself with as many pages as you wish. And you do this through your professional resume published on this web site . . . completely free. Employers and headhunters will find your professionally written resume through our resume bank and connect with you. You will find the right job opportunity for you . . . your dream job . . . through the free job listing service offered to employers by this job site. Alternatively, headhunters, employment agencies and big bucks employers will find you through the highly optimized data in the free resume database hosted on this job site. However, you look at it . . . YOU WIN. The truth is . . . the right job, with the right pay, and the right benefits is within your grasp. And this job opportunity could just be under your nose. What do you need to see it? What do you need to make your dreams come true? Just a little stir in the right direction. And that is what this site is designed to do for you. Oh, before I forget. This site actually take things a step further. We actually do more than just help you find your dream job through the job opportunity bank. We guarantee that you keep winning with your employers through solid career success tips delivered by the career development section of this site. So, if you are worried about finding the job just perfect for you, now's the time to stop worrying. If you are concerned that your resume may be hurting your chances of getting your dream job because it is not professionally written, here is the place and now's is the time to fix that. Ready for that dream job? Jump in and search the job opportunity bank. And be sure to post your resume in the resume bank. Before you begin, take a minute to subscribe to the Employment Guide Newsletter. This newsletter is delivered to your email box bi-monthly. Best of all, it is free. Subscribe using the form below. The job opportunity blog features updates to the job-opportunity-and-free-resume-bank.com site. Get listings of hot jobs. Access free resumes. Just subscribe free. The Employment Guide is the premium job opportunity and career development newsletter. Want to find a job and grow your career? Subscribe. It's free. Contact us. We value your feedback. We respond promptly to all legitimate requests. Job opportunities are available everywhere. But to plug in to the right employment opportunities, you need to know where to look. This is the right place. Job listing database. Job listings from all countries of the world. Premium employment listings for candidates who qualify. Free job postings. Free search. My scary post aptitude test true life story. How I almost missed my invitation for a hot job interview and what you can learn from what happened to me. Job Bank - Job Vacancies By Industry. Post Jobs. Find Jobs. Global job bank. Premium job bank with employment listings by industry. Employers post job vacancies free. Job seekers find employment opportunities free. USA jobs database. Americas job bank with hot usa jobs for qualified candidates, self-starters and go getters. Post job ads free. Search free. Connect. 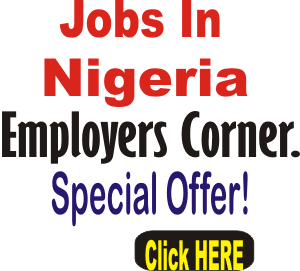 Jobs In Nigeria – The Nigeria Jobs Directory. Lucrative Jobs. Jobs in Nigeria posted by employers. This Nigeria jobs directory features lucrative employment offers for Nigerians and residents of Nigeria. Apply. Government Jobs - Government Employment. Post Jobs. Find Jobs. Government jobs worldwide. Government employment database with state jobs from all over the world. Post employment opportunities free. Find jobs free. Free resumes portal. Free resume directory where anyone can post resumes free and connect with international headhunters and employment agencies. Employment websites do a noble job. Job websites help people secure their dream jobs wherever they live in the world. These employment sites will help you. Job search engines provide a simple way to locate hot jobs. This job search engine helps you find local jobs as well as international jobs. Search free. Self employment guide with free self employment advice. Provides tips and techniques to become self employed and make loads of money. Solid advice to make money big time. Employment agencies with lucrative job offers. Premium employment agency database. Connect with employers and get hot jobs with the help of job agencies. Career builder. Careerbuilder and job bank. Career advice from seasoned career builders. Post jobs free. Find jobs free. Free tips to secure your career. Hospitality jobs worldwide from the premium hospitality industry. Post hospitality employment opportunities free. Find a job free. Connect with employers. Job search sites database. Database of job sites listing hot jobs for employment seekers. Need a employment fast? Visit this job opportunity site. Job news updated minute by minute as the news breaks. Global employment news in partnership with Google. Want a lucrative job? Subscribe free. True life story database. Personal stories by real people. Success stories, retirement stories, and job stories. Read, learn, and grow. Post yours free. Job questions from job seekers and employers. Answers are provided to these questions by the career advisor, Samson Itoje. Have any job question? Just ask. Would you like to share your knowledge about job opportunity? Great, find out how you can submit your story or tip here.